Welcome to Columbia, the beautiful City in the Sky. 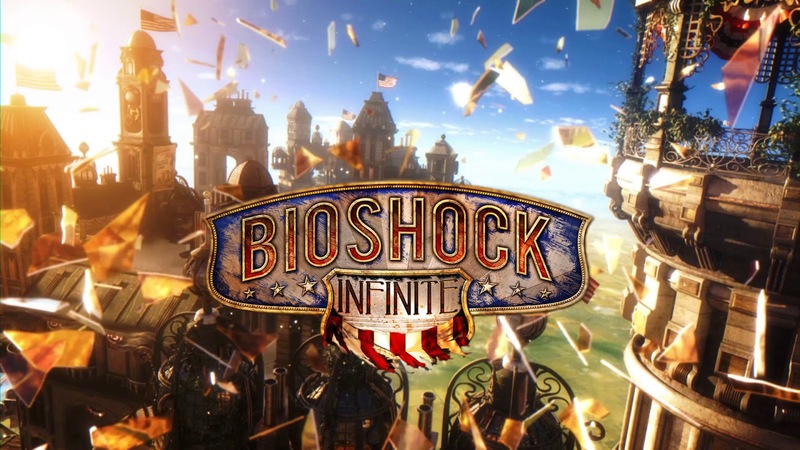 Those familiar with the prior games of the Bioshock series will quickly spot similarities between the games — Infinite includes many Voxophones and Kinetoscopes to clue the player in on some of the backstory of each game, as well as a similar fighting system. A somewhat unique addition to the combat situations in the game is the Skyline, which is a rail based system built to move cargo between different parts of the sky-dwelling city. 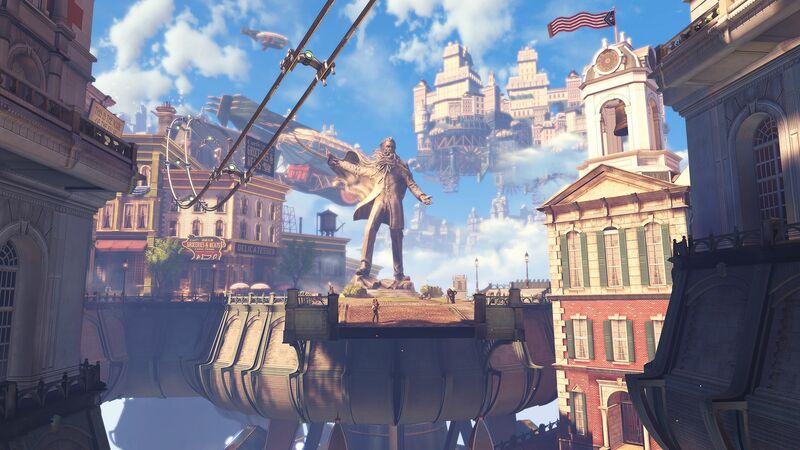 Booker is equipped with a “Sky-Hook” that allows him to attach himself to these rails, and the auto-targeting system allows you to shoot enemies from above as well as perform a special sky attack while dropping down to the ground. I will say that the rails take some getting used to — While you are able to mostly control general things like speed and direction, the overall feeling of shooting enemies while hanging from a rail and flying through the sky can be a little… Disorienting. 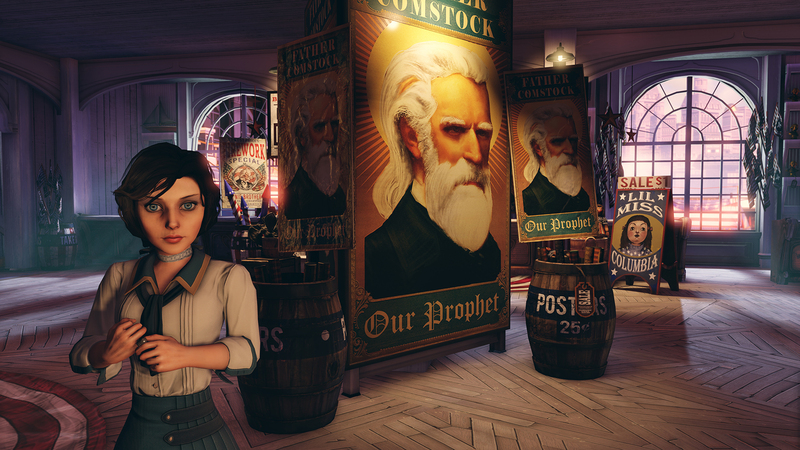 Like previous Bioshock installments’ Plasmids, Infinite offers the player Vigors — Many of which you may be somewhat acquainted with, under new names. My favorite of these are Possession and Undertow — The abilities to possess or sweep your enemies away with a huge wave of water, respectively. I will say that I really only used these two, although I gave a valiant attempt at trying to use all of the Vigors throughout the game. Some of them just didn’t seem necessary for anything, unfortunately. The main conflict in Columbia comes from its theocratic government style and the views of its ruler — or, The Prophet — Zachary Comstock. Comstock leads a group of Founders whose main goals include racial segregation, xenophobia and unethical scientific experiments. Opposing the Founders and the Prophet are the Vox Populi, led by Daisy Fitzroy. Despite the parallels between Rapture and Columbia, it is the differences that make each place their own. 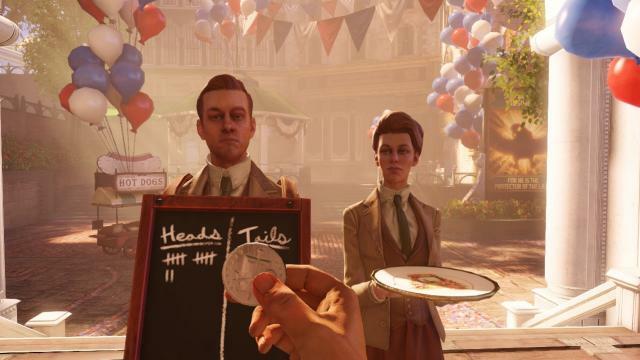 While your time spent in Rapture is after the fall of society, most of your time spent in Columbia is during — You are able to witness the fall firsthand, to interact with characters on both sides of the lines during the great city’s revolution. By the time you show up in Rapture, almost everything has already been said and done — the city is (mostly) abandoned, the majority of it lies in ruins and most of the “inhabitants” are insane and dangerous. However, when you arrive in Columbia, citizens of the city mill about at a carnival and you witness them taking care of normal, everyday activities like having their shoes polished or enjoying a scenic walk through the bustling streets. Although the war between the Founders and the Vox Populi has been going on for years, the main revolution begins while you are there — not before — and you play an integral part in the way that situation pans out. 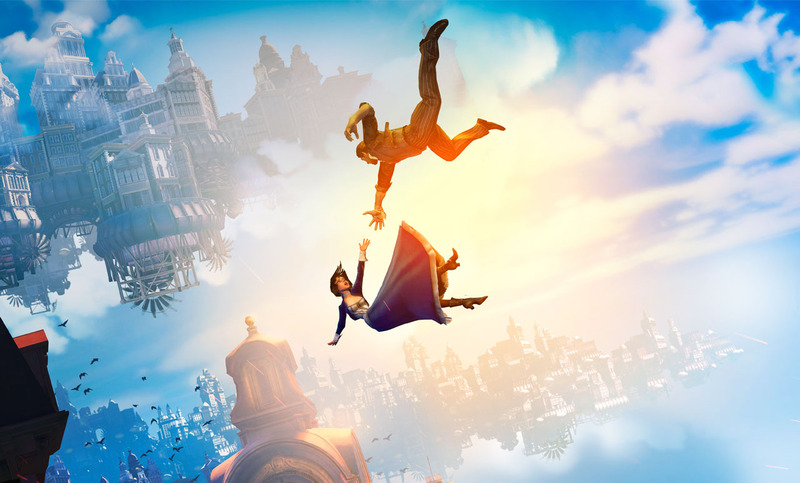 As Booker, your goal is to save Comstock’s daughter from imprisonment and rescue her from Columbia. The Prophet warns the city and his followers of the prophecised “False Shepherd”, who will bring destruction and chaos to both the city itself as well as to his daughter, Elizabeth. What you don’t find out until after you agree to save her is that she possesses a special ability that enables her to open “Tears” in the dimension — essentially, doorways to alternate timelines and realities. This is where things start to get a little confusing. It is revealed that with each choice and decision made, by the player and even just in general, an alternate timeline / universe is created somewhere with the opposing choice. For instance — If you wake up one morning and decided you’d rather get coffee on your way to work than make it at home, this choice will create an alternate time line in which you opted instead to drink your homemade coffee and forego the extra stop on your way to work. Each choice offers something different — We make millions of small choices like this a day, and if you stop and think about it, it’s pretty overwhelming. The beauty of Infinite is just that — It is INFINITE. There are limitless choices and possibilities, and the game introduces a way to manipulate dimensions so that you’re able to relive — and even alter — certain time lines. Elizabeth’s special ability is invaluable, and a crucial part of the game’s central story. With these Tears, she is able to help you in a myriad of ways ranging from battle equipment, health supplies and even to save your life by bringing allies and machinery into your fights to help you. Elizabeth’s AI is useful in other ways as well — For instance, when you’re in the middle of a boss fight but have run out of the Salts necessary to power your Vigors, Elizabeth will sometimes get your attention and toss a bottle over to you. She can do this with health items and Silver Eagle coins as well, allowing a second chance at obtaining items that the player may have missed otherwise. She also has a few skills up her sleeve that help you out immensely — primarily, her lockpicking skill. She allows you to get into certain areas that have gear, power ups and special bonuses for your weapons and character. Although you aren’t able to play as her (YET!!!! ), Elizabeth’s character is one of the most compelling throughout the entire game. 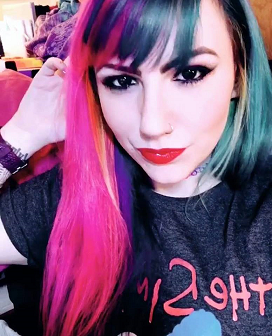 Her development and growth are portrayed wonderfully by voice actor Courtnee Draper, and as the game progresses, you learn just how integral she is to your character’s storyline. Those who grew to care for Joel and Ellie in The Last of Us will feel the familiar clenching in your stomach every time Booker and Elizabeth are separated by force or circumstance. Overall, Infinite manages to take a handful of hot topics — racism, segregation, elitism — and place them in a fictional city in the sky, separated from America and the rest of the world below. Alongside the portrayal of these real life political issues are themes of scientific and paranormal experimentation, time travel and spirituality. 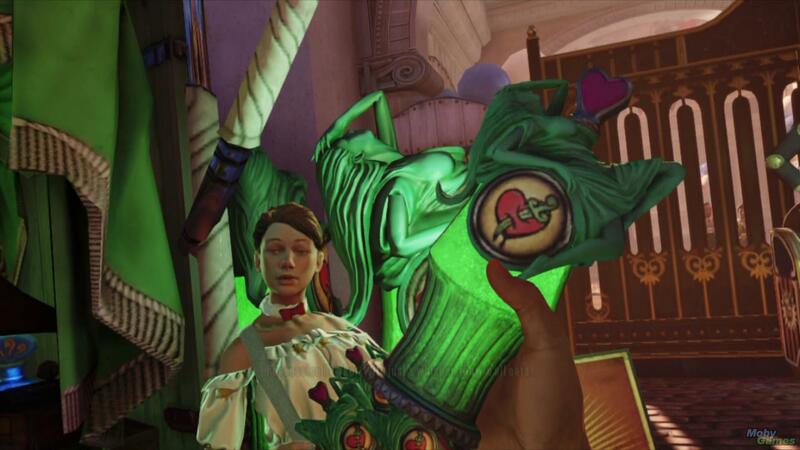 To say it is an incredibly unique experience would be an understatement, and I would definitely recommend the game to new or old fans of the other Bioshock games, or even just really good games in general. The attention to detail in Columbia is incredible. Unlike Rapture’s dark, creepy, underwater location, Columbia as a whole is brightly lit and most parts of it have an ethereal glow to them. The cobblestoned streets and gorgeous architecture make it one of the most beautiful video game worlds I’ve seen. From the cemetery gardens to the battle areas, each set is just as beautiful and well-developed as the last. Columbia’s city feel is reminiscent of Disney World’s Main Street USA — Which makes sense, since that part of the theme park was modeled after what Walt Disney’s childhood looked like in the very early 1910s. The Tears are also very interesting. Because of them, you’re able to hear songs and see things from the future as well as the past and so, despite being in 1912, you may catch a few lines of Cyndi Lauper’s “Girls Just Wanna Have Fun”, even though it technically isn’t even a song yet. There are lots of small little Easter Egg type things like that — I would highly recommend this article, which I found after playing the game. It’s really neat and shows some of the stuff you may have missed during your first time around in Columbia! The beginning and end of the game were more interesting than a lot of the middle for me. There is a part of the game where I just lost interest and put it down for awhile because it was a lot of running back and forth to complete certain tasks. This also isn’t exactly a complaint, but I do wish the Lutece twins had a bit more story in the game. I know that a lot of their information is given via Voxophone, but I really liked their characters and was always pleased when I’d hear them nearby! The enemies in Infinite were pretty varied, and it was neat that certain enemies could be affected by certain Vigors to varying degree. For instance, the mechanical president Patriots are especially sensitive to water and electric, which makes sense because they’re robots! 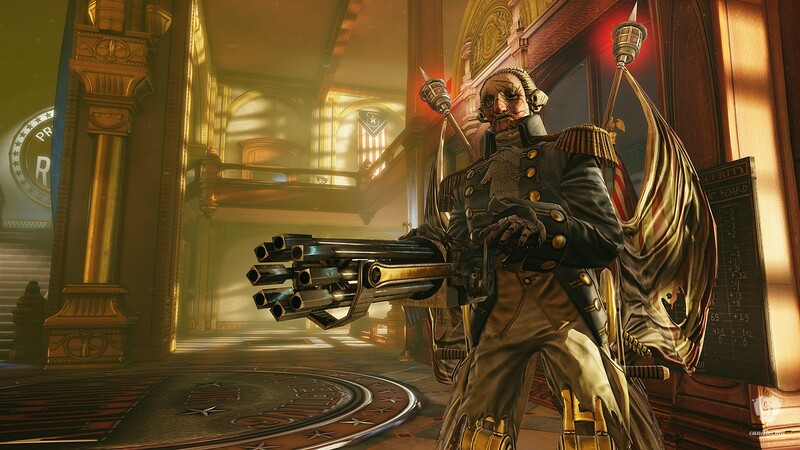 Each of the different enemies you face has their own story — You can check out either the Bioshock Infinite Wiki or the strategy guide for more information on how they came to be, what they are, etc. There are a handful of tougher enemies as well as hordes of the more annoying, lesser ones. I personally thought the Rapture-esque Boys of Silence and the angry talking Handymen were some of the best baddies of the game — although you don’t fight the Boys, they alert tons of Lunatics that come after you. These are minion-type melee fighters that wear super creepy President face masks! There is also a recurring “enemy” aptly called Songbird that acts as warden while Elizabeth is locked in her tower. The dynamic of their relationship is expanded on later on, as are the origins of the bird itself through found Voxophones spread throughout the game. 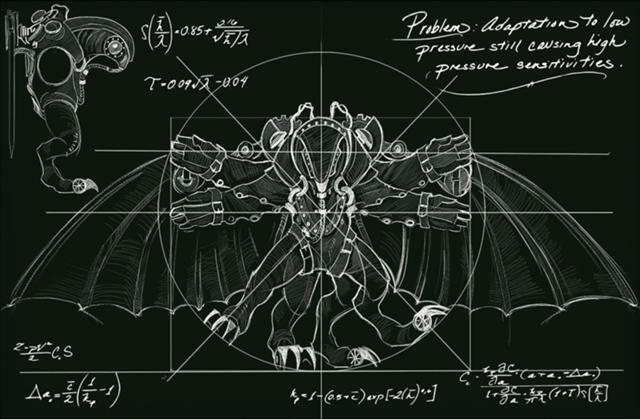 The Songbird is a lot like the Big Daddies of past Bioshock games in that it is a sort of scary protector type creature, made out of the desire to create something more than man and beast themselves. The amount of thought put into the story isn’t as apparent during gameplay as it will be afterward, when you begin looking into the underlying story of what really happened. The last 30 minutes of the game are fast-paced and hit you right in the feels with the truth of everything leading up to that point. I would really suggest doing a bit of research after you finish, to make sure you fully understand the game. However, I’d urge you to be careful and use a bit of caution — There are quite a few theories out there, and not all of them make sense! 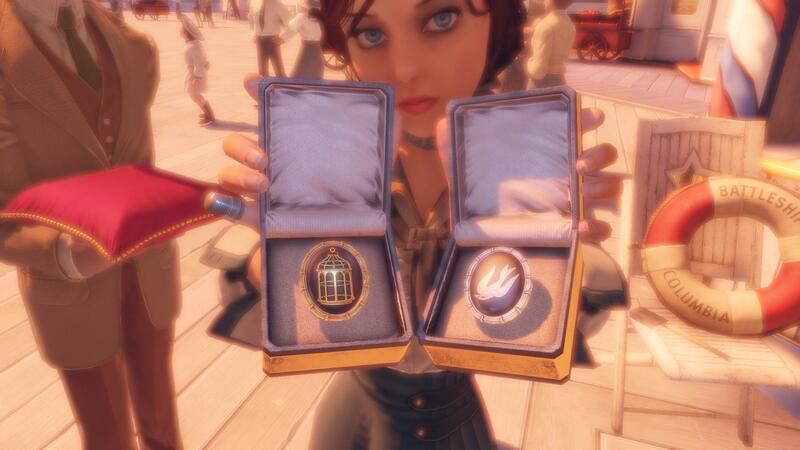 I love Bioshock! But, have not played this yet. Look’s sweet. Great review.